Christo’s early years were spent on a small farm outside Stanford. He went to a small school on a nearby farm from the age of 5 years. Life was tough – the family had no luxuries; no electricity. After matric, Christo joined the prison service. 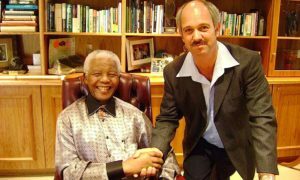 After a year in Kroonstad he was sent to work on Robben Island in 1978 at the age of 19. That was when he first met Nelson Mandela who at that time was 60 years old. This was where they formed a relationship which was to become so much more. In 1982, Mandela was transferred to Pollsmoor Prison. Soon afterwards, Christo was transferred there and was responsible for guarding Mandela for the next 6 years. On his release from prison, Mandela organised a job for Christo as an administrative and logistics manager in the Constitutional Assembly. Once the Constitution was adopted, Ahmed Kathrada arranged for Christo to start work again on Robben Island – this time as supervisor in the island shop. The wheel had turned full circle and Christo was back where he started his work career. In 2014 Christo wrote his book “Doing Life with Mandela – My Prisoner, My Friend”. In the Foreword, Ahmed Kathrada writes: “My lasting impression of Christo Brand is that he’s a very good human being. He’s not a politician; he’s just a very caring man who took chances for other people, which could have brought him trouble.